Hi all, welcome to the blog today. It's been a long time but I think that will be the way it is for the time being. Inspiration isn't coming consistently these days! I've had some sunflower things sitting on my work table for several months and I really wanted to do something with them. Linda, from The Funkie Junkie Boutique, always places wonderful little gifts in orders (thanks, Linda). In one order back in late August or early September she gifted me with sunflowers! I love sunflowers and always have them in the house late in the summer. They are so cheerful and bright and make me smile when I see them. So, I knew right away that I wanted to use some of the things in the package for a sunflower tag. But, everything sat on my table and life and the holidays intervened and no tag materialized! Now it's almost spring here and I'm thinking about our garden and the different flowers and vegetables we're going to plant this year. 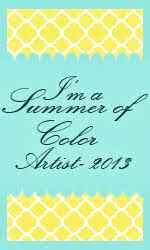 I've seen a few new sunflower varieties that I want to try and that sent me to my table to make my tag! 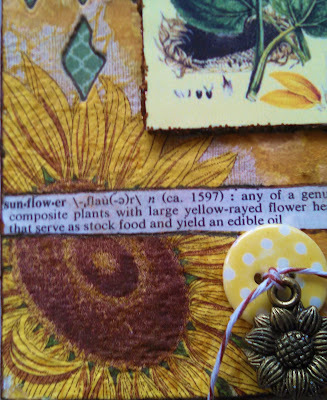 Over at the Frilly and Funkie Challenge blog the theme this time is Layer It Up so I thought I would do just that with my tag and all the sunflower things I had sitting there. I used a size 8 tag and I sprayed it with Fossilized Amber Distress Spray. I used a flower stencil and sprayed again with Pirates' Plunder Gold Moon Shadow Mist from Lindy's Stamp Gang. When all that was dry I sprayed Sunflower Sparkle Perfect Pearls Spray lightly over the entire tag. 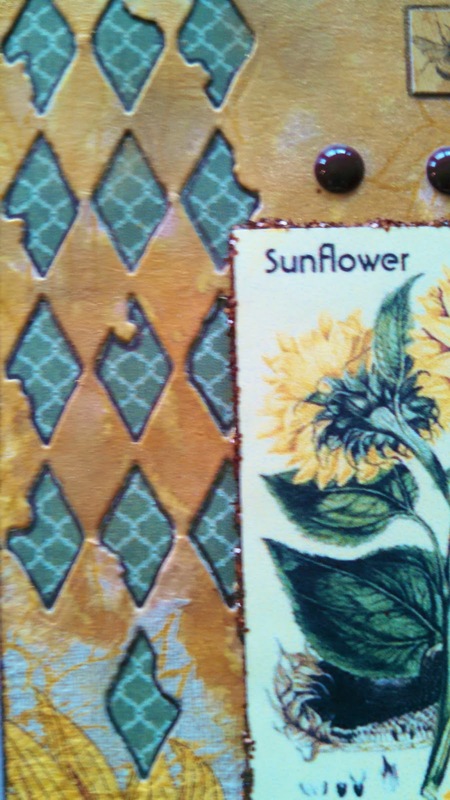 Using Fossilized Amber Distress Ink I stamped a sunflower stamp randomly over the background. It's very subtle and doesn't show in the photos but it adds some dimension to the background. From my stash I took a sunflower cocktail napkin and used gel medium to adhere that to the bottom left of the tag. Tim Holtz Thinlets dies are fun to use and I decided to use the diamonds to cut out part of the tag. 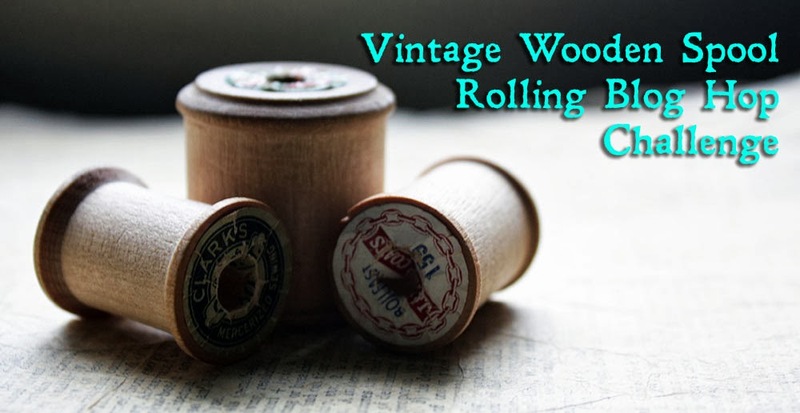 For a backing I used one of the papers from my favorite Graphic45 designs, French Country. I attached the tag to the piece of paper and then cut it to size. As part of Linda's gift was the botanical print of the sunflower. I glued it to a piece of chip board and edged it with Vintage Photo Distress Glitter. I attached it, and a definition of "sunflower" that I tore out of an old dictionary, to the tag along with a banner sticker and the Le Jardin sticker from the Graphic45 paper set. The brown dot stickers filled in the space above the botanical print. The button and sunflower charm were part of the gift. I decided to add some definition to the diamond cut outs by outlining the inside of each one with a Pitt Pen in Sepia. I also outlined the strip of dictionary paper and the Le Jardin sticker with the pen. Hello, everyone! Welcome! I hope you have gotten back to normal after the bustle of the holidays. I'm slowly getting back to my old routine. It had been disrupted all Fall because of renovations we were making to our house which lasted until the beginning of December. But, since that's done and the holidays are over I think I'm ready to settle into winter. Unfortunately, my muse has not been seen around here since late September and so I haven't had much inspiration from her! So, I had decided last week to start slowly getting back into Zentangle since it is a relaxing form of art and I enjoy doing it. I thought I would start back at the beginning with a tile, pen and pencil and not try to do anything that wasn't basic. 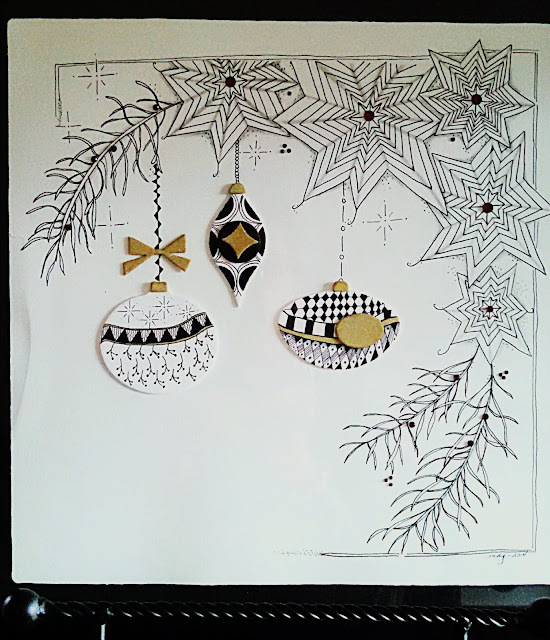 Then on Monday Laura, The Diva, announced her weekly challenge, #250, which was going back to old school Zentangle. She wanted everyone to use a tile, pen and pencil! Sounds like synchronicity to me! So, yesterday I sat down and got back to basics! Here is the tile. My first attempt for this year didn't turn out too badly, I used some favorite tangles and now I think I'm ready to try to wake up the Muse a little more!! We'll see. I'm going to link this to the Diva Challenge and be happy to have done some art! That's about all I have to share for today. Thank you for visiting. I really appreciate having you stop by the blog! Greetings of the season to all of you! I hope you had a wonderful Christmas spent with family and friends! Our family was together and we shared the day with friends who are like an extended family. It was our tradition and we love it! Above is a photo of our tree. It's full of ornaments hand made or gifted from friends, some have been purchased, but always because we love them. 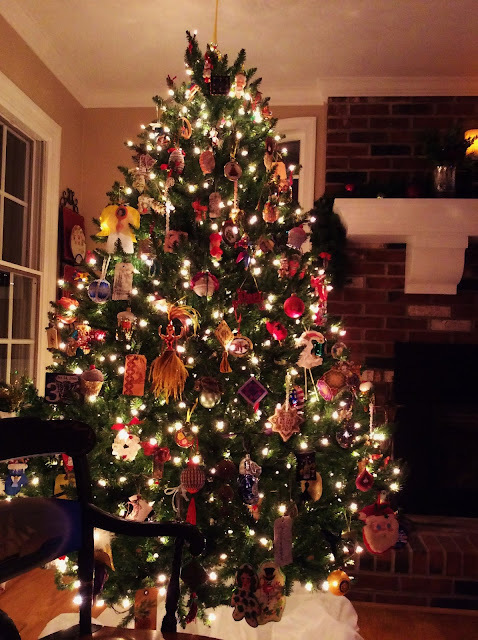 Certainly not a designer tree, but full of love and memories spanning 40+ years! It's the star of the holiday decorations for us! My absence from the blog this year is because there was so much going on in our home. But, I'm hoping the New Year will have me back in the studio creating. I did have one new decoration to add to the mix this year. It was a Zentagle Inspired Art piece that I had started in a class last year and finished after the holidays. I just love the simplicity of it. I framed it in a simple black frame and displayed it on a black easel. It was the biggest Zentangle piece I've done and it was a challenge to work that big. Here are some other photos. 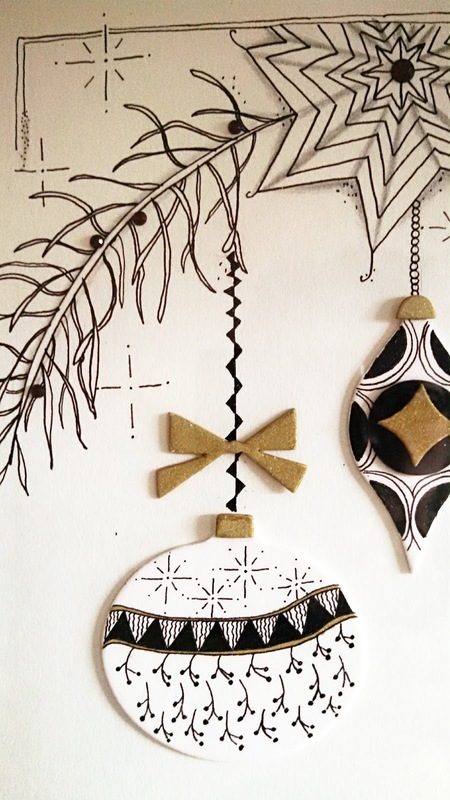 While I love sparkle and shine, and lots of glitter for the holidays, the simplicity of Zentangle is so appealing. Hello, everyone! It's hard to believe that it's almost Thanksgiving here in the US. I often find that Fall seems to more quickly than any other season. When my kids were young and still in grade school and high school I thought that was the reason. But, now they're adults and out of the house and I still find that this beautiful season just whizzes by. I try to enjoy it as much as I can. This year it's been difficult to really find time for much of anything. A variety of family things have kept us hopping. 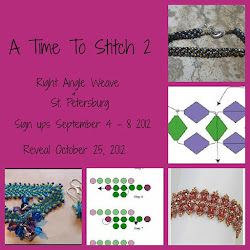 But, now it's time for Therese and Christine's blog challenge A Time To Stitch. This is the 8th challenge, which is also hard to believe! The theme this time was What's Your Bag. We were supposed to bead embroider on a purse, amulet, evening bag, or some other bag of our choice. I cheated a little. 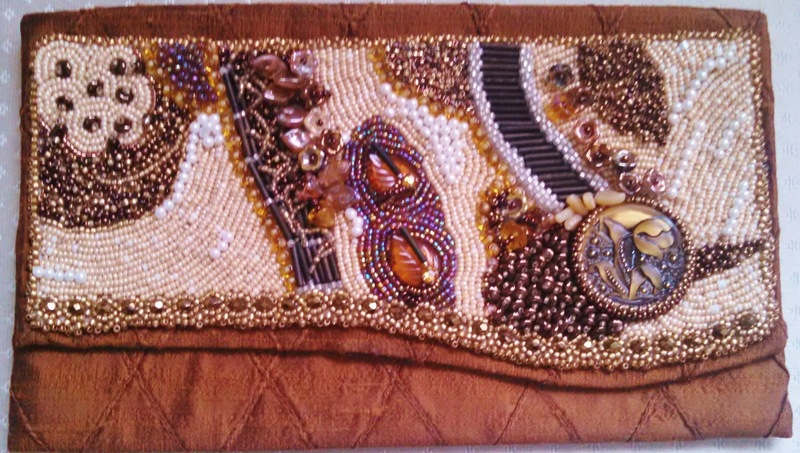 I had made an evening bag with a bead embroidered flap at the request of my friend, Christen Brown. She was writing a book on different types of embroidery and asked if I would do a bead embroidered bag of some sort. So, I made a little clutch bag out of pintucked silk fabric and I embroidered the flap. Here is what it looks like. I made the pattern for the shape of the flap and then traced it on Lacy's Stiff Stuff. I traced a rough outline of spaces I wanted to fill and started stitching. I never have a firm idea of what a design is going to look like. I wanted this to hint at an abstract garden surrounded by rocks and stones. The colors were chosen to coordinate with the fabric. Here are some details. So, there it is. I had fun making it. 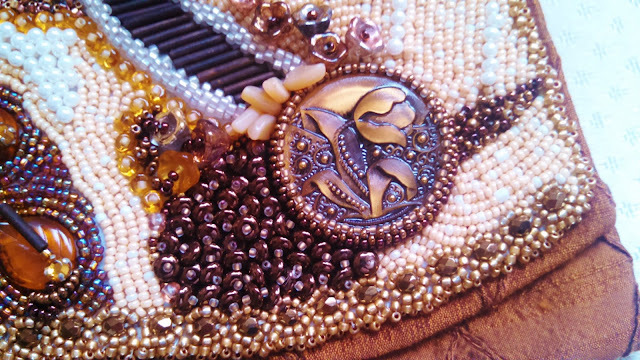 I love doing bead embroidery. 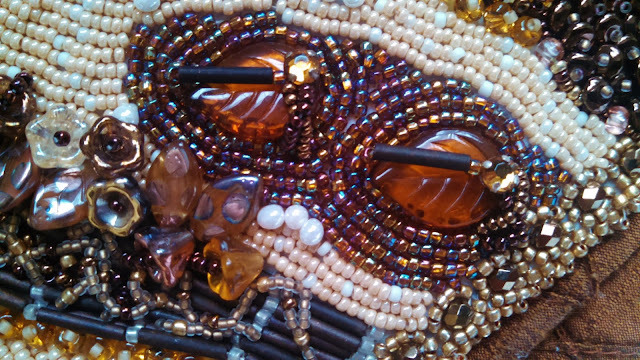 I love making it textured and using different shaped beads. 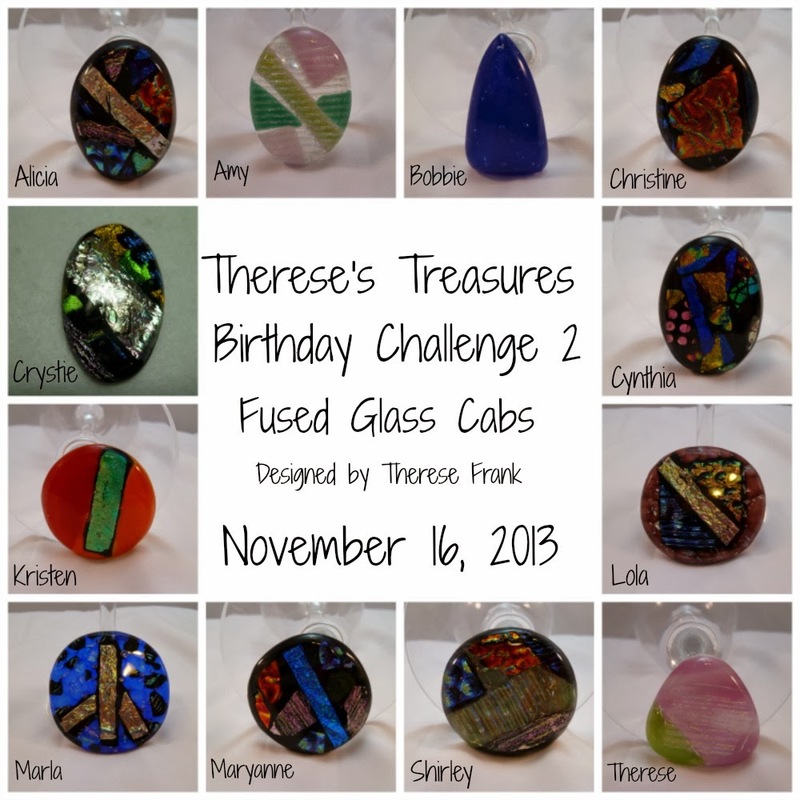 I want to thank Therese and Christine for hosting this challenge. It's really fun to participate and I can't wait to find out what they decide to do next time. Hi, everyone! Thanks for dropping by today, the day before Halloween! I can't believe we're this far into the Fall season already. Of course, things have been hopping around here so the time has gone by quicker than usual. I had gotten the paper mache witch's hat at Michael's last year on sale. I had plans to do something with it this summer. Well, that didn't happen! I always plan to do Fall and Halloween things in the summer but it rarely happens. Anyway, I thought this was my chance to use the hat. I painted it with black gesso and used Peeled Paint Distress Glitter on the edge of the brim. I glued black feathers and glittered leaves as a hat band and then used a black and an orange die cut cat that I had from another sale package from Michael's. The little purple glittered spider is also from the same package of die cuts. I found some little skulls in my stash and glued that in front of the cat. Using an awl, I poked a hole in the point of the hat and inserted a black wire with a glittered star on it. Here you can see some details. This is about as spooky as I get! I love Halloween but not the way Halloween is now. I don't like the gore and horror that has become so prevalent now. I like the vintage Halloween of cute Jack-o-lanterns, cute little witches, black cats to go with them, and cute little ghosts out on the prowl . So I do a lot of my own things for Halloween since I love to include it in my Fall decorating. I'm so happy that I decided to use this hat for the challenge. I'm heading over to the Frilly and Funkie blog now to post it. Check the other entries. They are always great! Hello everyone! It's a gorgeous warm Fall day here and I wanted to share a new project with you. Known as an exploding box, it's a project I've wanted to try for a long time. I love boxes and these are so easy to make and so much fun to open! My friend, Patti, is a certified Zentangle teacher and she gives classes at her shop, The Queen's Ink. 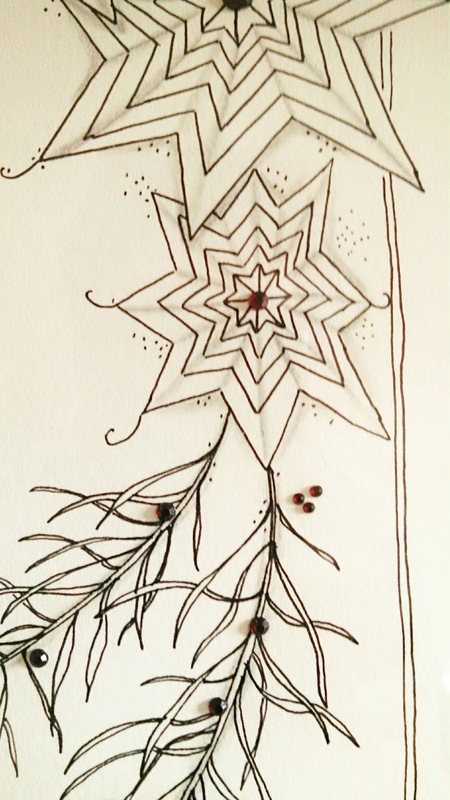 She does intro classes and follow-up classes in basic Zentangle but she also offers seasonal classes. I'll share last year's Christmas project as we get closer to the holidays. This year for the Fall season she taught an exploding box with Zentangle components. Technically it's called Zentangle Inspired Art, or ZIA for short. Whatever you want to call it, I called it fun! Here's a picture of the box. We started with two pieces of 12x12" cardstock for the top and bottom. The top is made with origami folds and the bottom was folded and cut so that it would form a box. We cut out stamped images of the leaves and acorn and then did the tangles. I used Distress inks and a water pen to watercolor the leaves. The acorn was stamped on kraft cardstock so I just lightly colored some shading on it. Patti had used white gel pen highlights on her leaves and I was really impressed with the way it made the designs pop. I did the same and it's amazing the difference. I chose an orange CS square to create a background for the grouping of leaves and acorn and did some pen work around the edges. I glued the leaves down and use dimensional glue dots for the acorn. But the magic happens when you open the lid! Here is what it looks like. You may be able to see that there are two levels of panels inside the box. You can add more levels if you want. Once the lid is taken off the box falls open, or explodes, and you can attach anything you want inside. I love when there are dimensional things in the middle. I used acorns and some descriptive word stickers for Fall around them. Then I used the Tim Holtz Tattered Leaves die and his small pumpkin and acorn die to cut watercolor paper for the leaves and pumpkin and acorns I used on the panels. I did Zentangles on each one and used Distress inks to watercolor them. I also added some shimmer to these with Lindy's Stamp Gang Magicals. They are dry shimmery pigments that I use with a water brush and then highlighted with the white gel pen. Here are some of the panels close up. Unfortunately, the shimmer doesn't show up in the pictures. Each panel has a leaf or the acorns or pumpkin. I just love handing it to people and seeing their reaction when they take the lid off! I was so pleased to finally have a reason to make an exploding box. It seems that right now if I don't have a reason to sit down and work on a project I don't find (or make) the time. That has to change, for sure! Hello on this dreary Sunday morning on the East Coast of the US! I may finally be back to creating and blogging! I say "maybe" because there is a lot going on in my world. We are doing some upgrades in our kitchen and family room. You know how they always say that once you start something like this you find that the job grows bigger! Well, this has lived up to that saying and it's gotten a little more involved than we thought it would. And, being the kitchen and family room it's been rather disruptive. But, I'm excited about the changes we're making and it all should be done by the beginning of December, just in time for me to turn into the Christmas elf and decorate to my heart's content! Since I can't really do much in the rest of the house I'm hoping that now that the major decisions have been made I can get down to my studio and finish projects that have been around in various states of completion all summer. We expanded our garden this year and the weather wasn't too hot so I was able to spend more time out there which is why not many projects were finished, or even started. Hopefully that will start to change now. I really miss the creative process even though I consider gardening creative. 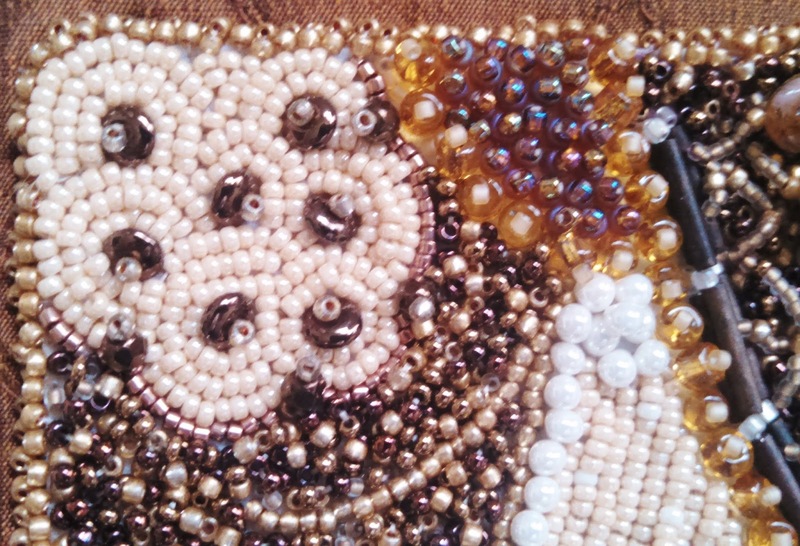 Having said all that, I did manage to finish one beading project. It wasn't terribly involved and didn't take long to do! But, I love it and I wanted to share it with you. It's another geometric beadwork project inspired by Kate McKinnon. I kind of teased it in my last post on who inspires me. You can read that here. Here is the completed pendant. It starts with a warped square which I love stitching. I made an entire bracelet in warped squares last Fall. You can see that one here. The directions for stitching a warped square are in Kate's first book on geometric beadwork,﻿ Contemporary Geometric Beadwork. Early in August Kate sent out an email with the idea for a new project, create a warped square and then work and exploding round and keep going until you had the number of rounds you desired. The exploding round is one of the innovative concepts that Kate came up with while working on the book. It's difficult for me to explain it so that it makes sense but Kate has a wonderful YouTube video that makes it all clear and you can also find the instructions in her book. I admit that I wasn't sure how it worked when I read the printed instructions but once I watched the video it was easy to do. I started with the warped square that I turned into the bail for this pendant and from there stitched the largest square. On the final round I added drops for the corner beads. I did 2 more squares, the medium and small, and then stitched the smaller squares. Then I played with how I wanted them to be arranged and the pendant you see is what I came up with. I love it and it's light weight and fun to wear. As I said, it was fun to do and didn't take very long at all. Which is probably why I finished it!!! I chose the colors for a vineyard feel. 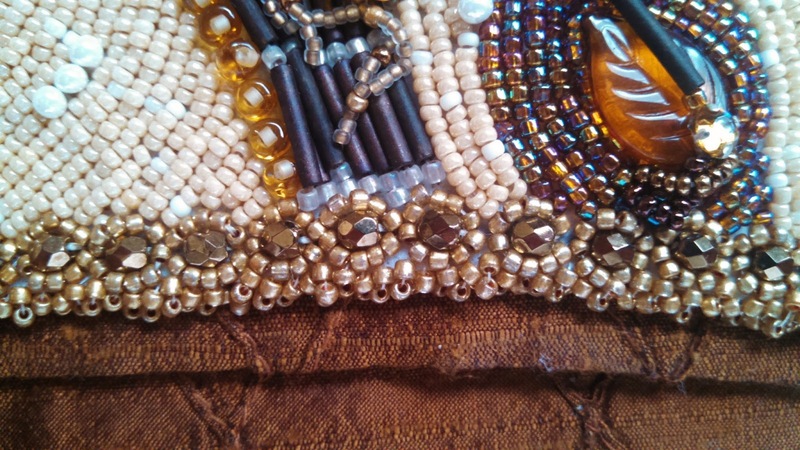 I'm in love with geometric beadwork and I'm working on a cuff bracelet that is coming along slowly. I want to thank all of you for visiting me especially after such a long break from blogging. I really appreciate your visits and all your wonderfully kind comments. Have a wonderful day!